Antarctic rock-gods GWAR released the first line-up for this year’s GWAR-B-Q, located at Hadad’s Water Park in Richmond, VA. This year sees the event entering its fourth consecutive year while offering its most bone-crushing line-up yet, setting the stage for what will certainly be the most massive GWAR-B-Q in the history of the human or any other race! The event is scheduled to take place Saturday August 17, 2013 at Hadad’s Water Park in Richmond, VA, located at 7900 Osbourne Turnpike. Doors will open at 10:00 AM and the first band will hit the stage at 11:00 AM. For more information be sure to visit: http://gwarbq.com. Ticket information will be announced shortly. Local faves and international thrashers Municipal Waste will provide main support to the mighty GWAR, and in turn will be supported by a plethora of devastating acts, Corrosion of Conformity, Pig Destroyer, Cannabis Corpse, Loincloth, Kung-Fu Dykes and many more. Once again Hadad’s will host two stages with bands all day. 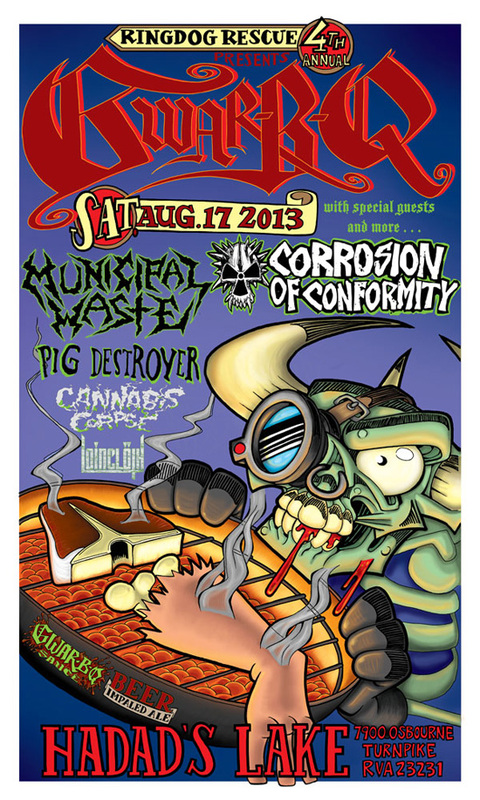 Plus, there are rumors of a yet-to-be-announced act that will put this year’s GWAR-B-Q 2013 completely over the top! “Once again we blow the horn of war and set into motion the gears that grind us towards the greatest GWAR-B-Q yet,” said unrepentantly horny front-thing Oderus Urungus, fresh off debuting GWAR’s new “GWAR-B-Q” sauce at a strongly attended event at the world-famous Grinders in Kansas City (see more details HERE). That’s right, the 4th annual GWAR-B-Q is poised to make yet another stinky mess in the crotch of today’s scene — BE THERE OR SUFFER THE SHAME OF BEING INCREDIBLY PATHETIC! In other Slave Pit news GWAR is wrapping up a new album, their thirteenth and first since the passing of longtime guitarist Cory Smoot in late 2011. Coming out later this year, the album features the debut of Pustulus Maximus, cousin of the mighty departed one, Flattus Maximus. The band kicks off their tour tonight in Tucson, AZ and will be on the road through April 25 in Jacksonville, FL. These dates will serve as the final leg of the “Fate or Chaos” tour, which chronicles GWAR’s epic struggle with an angry God. The GWAR show on April 17 in Denver (Englewood,CO) will be broadcast live on AXS TV. The broadcast will air at 12:00 AM EST/9:00 PM PST. AXS TV is available on: DIRECTV Channel 340, DISH Network Channel 362, AT&T U-Verse Channel 1106, and Verizon FiOS Channel 569. For additional affiliate and distributor channel information including Charter, Comcast Xfinity, Suddenlink and others please visit: www.axs.tv/subscribe. This entry was posted in METAL and tagged Celebrities, Corrosion of Conformity, Entertainment, Flattus Maximus, gaming, Gwar, GWAR-B-Q, Internet radio, metal radio shows, Municipal Waste, Oderus Urungus, Pig Destroyer, stinky mess, transportation, Tucson Arizona. Bookmark the permalink.